Classic '60s fuzz and 5 tone-sculpting knobs. Wayne says: "They put a Z.Vex Fuzz Factory inside the guitar." I'm also sat with his guitar tech right now and he confirmed this and if you listen to the last album you can hear this pedal in some of the tracks if you know how it sounds. (According to Shane). The 3rd ZVex pedal that Miles uses; the standard Fuzz Factory. In the picture its the green with brightly coloured writing pedal, along the top of the board above the Memory Man and between the Memory Boy and the PS6 Harmonist. At the 16:45 mark of James Valentine's rig rundown displays a ZVex Fuzz Factory. Information courtesy of a Brazilian website ( reliable source ) about pedalboards . The ZVex Fuzz Factory was pictured in the pedalboard Instagram shot on stage. James Richardson of MGMT has been seen with a Zvex Fuzz Factory on his live rig pedalboard. 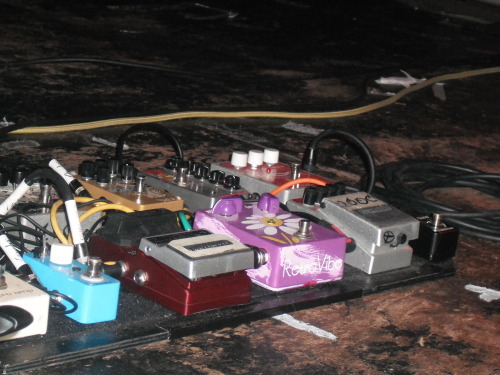 "This is Tegan Quin’s pedal board. Upper row: [Boss NS-2](http://equipboard.com/items/boss-ns-2-noise-suppressor-pedal), [OD-3](http://equipboard.com/items/boss-od-3-overdrive-guitar-effects-pedal), [LS-2](http://equipboard.com/items/boss-ls-2-line-selector-power-supply), and [TU-2](http://equipboard.com/items/boss-tu-2-chromatic-tuner). Lower row: [Ibanez TS-9](http://equipboard.com/items/ibanez-ts9-tube-screamer-effects-pedal), [Boss CE-2](http://equipboard.com/items/boss-ce-2-chorus-guitar-effect-pedal), [MXR MicroAmp](http://equipboard.com/items/mxr-m-133-micro-amp-pedal), [Boss DD5](http://equipboard.com/items/boss-dd-5-digital-delay-pedal) and a Zvex Fuzz Factory." - [*Mix Online*](http://www.mixonline.com/news/tours/all-access-tegan-and-sara/368190). "I always use the Zvex Fuzz Factory," Cline says in this Premier Guitar interview at (26:10), "which most people recognize at being really strange, and intense, and uncontrollable." At 16:10 in this Rig Rundown for Vigilante Carlstroem of [The Hives](http://equipboard.com/band/the-hives), his gear is displayed, showing his ZVex Fuzz Factory. 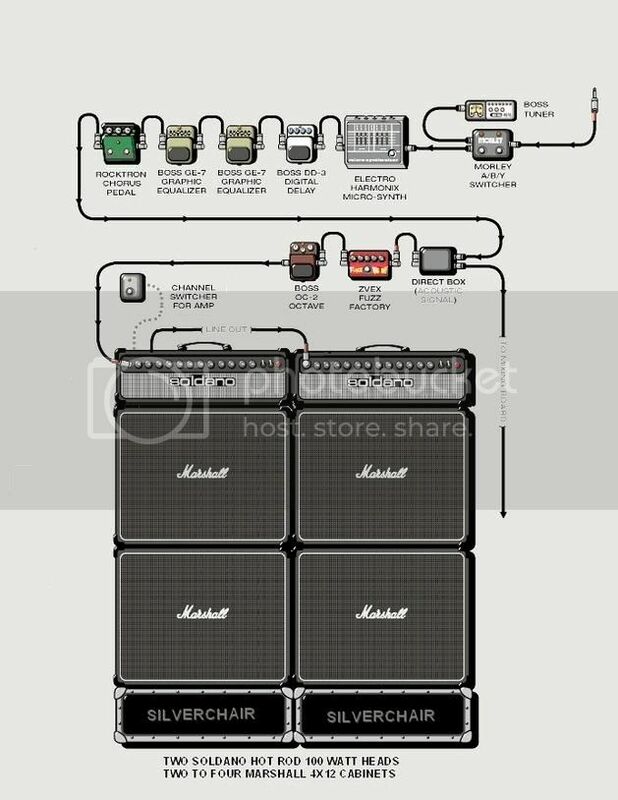 A detailed [gear diagram](http://www.guitargeek.com/stephen-carpenter-deftones-guitar-rig-and-gear-setup-2011/) for Stephen Carpenter of [Deftones](http://equipboard.com/band/deftones), traces the signal flow of the equipment, containing a ZVex Fuzz Factory, in his 2011 guitar rig. "My live signal path is guitar, wah, volume pedal, Fuzz Factory, OCD, PlimSoul, Micro Amp, various delay and reverb pedals, and the Akai Head Rush looping pedal." I've known for years that Daniel Johns used the fuzz factory, especially for across the night tours. And I believe beyond that as well. There isn't a whole lot of pics of his pedal board since they broke up. But I remember reading about him using it. It's also on Zvex FuzzFactories Wikipedia site of known users of the FuzzFactory. Which lists Daniel Johns as a known user. Drozd: I love to use the Z.Vex Fuzz Factory, because that pedal is insane. It makes the same crazy fuzz sound regardless of the guitar and amplifier. It just takes over whatever you are doing. I really got into the Zvex Fuzz Factory. According to [this interview (transcribed from the February 2000 issue of *Guitar Player* magazine)](http://www.geocities.ws/sg3ebfreak/guitar.html), Kevin utilized a Fuzz Factory during the recording of Third Eye Blind's second album, *Blue*. Pictured on the band's official Instagram, Grant recording the new Feeder album. > That’s a bit of gear I do know: the ZVEX Fuzz Factory pedal. They have a couple at Q Division studio and I finally bought one for myself. I just love it. I used it a lot on the album—it’s really good for soloing. It’s got a gate, which lets you get a heavy sound but with no sustain. It just cuts off at the end, like [makes a short tire-screeching sound]. I just love that effect. It makes it sound like the amp is breaking apart. 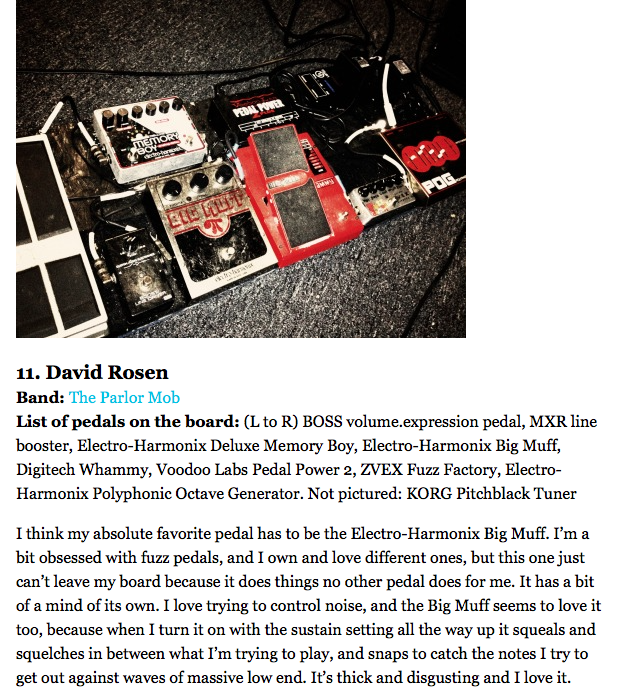 David uses a ZVex Fuzz Factory, as shown in [this](http://www.pastemagazine.com/blogs/lists/2012/05/14-guitarists-talk-about-their-pedal-boards.html?a=1) Paste magazine article. In Royal Thunder's Rig Rundown in PremierGuitar, Josh shows us his ZVEX Fuzz Factory. My guitar goes into a Lehle D.Loop SgoS Effect Looper/Switcher, which has two loops. Loop A contains a Prescription Electronics Experience Octave/Fuzz, a Dunlop wah, a Boss OD- 2 Turbo OverDrive, and a Rat distortion. Loop B contains a Boss DD-5 Digital Delay, an Alesis Bitrman ModFX multi-effects processor, a Z.Vex Fuzz Factory, and an Electro- Harmonix Micro Synthesizer. In this video Andy Othling shows his rig including a Fuzz Factory. 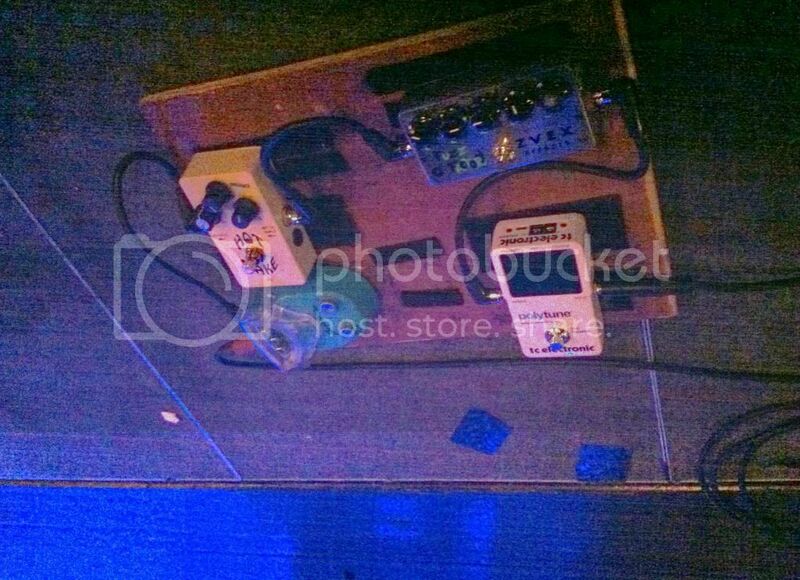 In this picture (which I can confirm is Harry's pedalboard), a Zvex Fuzz Factory can clearly be seen in the top. Julien shows off the pedal in this video. In this Guitar Player article Bill Frisell says that "If I want to go completely haywire I’ll use Z.Vex Fuzz Factory...."
This Hand-Painted Fuzz Factory is been placed at the last position of the effect chain, which is A/Bed with the Shaffer Replica boost pedal, before the Marshall amp. "Then with some of the other parts I dialed in some tones with a Z.Vex Fuzz Factory. On the very high end I do a slide part, which is like trumpets with a mute on it." "I use a pedalboard, but I can never really decide on the pedals I want to put on it. The pedals I use most are a Strymon Flint, a Creepy Fingers fuzz, a ZVEX Fuzz Factory, a vintage Fuzz Face, and some others. I have a lot more from people who build me stuff that don’t always make it on the board. I have a lot of fuzz pedals, boost pedals, and preamp-type things. Normally, I always use my old Fuzz Face and just a Cry Baby wah. A new find is this Carlin compressor pedal, which is one of the most radical pedals I’ve ever stumbled upon. There’s actually a clone made now by a guy named Moodysound, and it’s really good." In this Instagram post, Alan can clearly be seen to have a Z.Vex Fuzz Factory on his board. Here Jacob says he uses the ZVEX Fuzz Factory. This video (which has since been deleted) shows Rainbow giving a tour through his home studio. At around 2:45 he shows the Yamaha PSR-36 which has 3 effect pedals on top of it. The green one in the center can be identified as a handpainted Zvex Fuzz Factory. The Fuzz Factory from ZVex is a 5-knob fuzz pedal with 2 old-stock '60s germanium transistors. Though the circuit isn't modeled after any one specific classic fuzz effect, it delivers tones straight out of the 1960s. These 5 knobs control the Fuzz Factory's parameters at various operating levels, letting you shape your own personalized fuzz. ZVex designed the Fuzz Factory to consume less energy than other effects pedals. When on, the Fuzz Factory's current is less than 3 mA. This fuzz pedal is hand-painted and assembled by hand too so each is unique. Includes a 9V DC power jack and green on/off LED. Stability: Use to control feedback pitch. This is one of the pedal's more finicky controls, so it will take some experimentation to get it right. Note: Due to the nature of each hand-painted Fuzz Factory pedal, there may be a slight difference in design from the posted image. I use a DIY Fuzz Factory clone I built a few years ago. Sounds pretty close to the real thing. Great for really gnarly fuzz and crackly feedback. Incredibly versatile! It's the pedal that showed me that sometimes it's better to have more than just a level, a tone, and a gain on your fuzz box! This is one of my favorite pedals. It cuts through and it has a real cool tone. Not for everybody though. Oscillation for Day and Ballsy as hell. Just wish it was better with bass. I bought this pedal off of a friend, and it was worth every cent let me tell you. Not only can you get everything from a bright, brittle classic fuzz to a thick and syrupy synth-like sound and everything in between, but so many variables can alter the sound drastically that it's like a new adventure every time you sit down with it - messing with your volume and tone can help shape the tonality, attack, and pitch of the self oscillation (which i've straight up used as it's own instrument, tweaking knobs to get cool effects and melodies). It's very quickly found a place on my main board and in my music, as it does both thick chords (especially in my primary tuning, Open C; it just stacks like an impossibly driven amplifier) as well as hard-defined and impactful single-note runs. Live, I run it before my wah and use it to get INSANE filter sweeps. Two biggest downsides for me are as follows: 1. it's piss-poor with bass, at least in my experience. It doesn't seem to handle the bass frequencies well, regardless of which pickups, strings, or necks are being used (though so far it works BEST with just a bridge humbucker active). Second issue is that, due to how finicky it is, it's hard to recall past settings, 'cause even the slightest tweak can throw self osculation out of pitch or cut off note tails too soon or what not. As such, i tend to focus less on finding a "Sweet spot" and more just grabbing "what's working right now for this", especially since i'll likely mess with the parameters later on anyway for some noisy-play. But the sound and playability of just the pedal itself easily make up for it. Since I rely on backing tracks a lot to pull off my industrial style, this pedal alone has injected some much needed organic feel to my sets, and has opened up a whole door of possibilities for me, as i plan on investing in more fuzzes (as well as compact synths). Like it's called, it's a factory for fuzz. One of the nastiest fuzz pedals I've ever used. It's like a Russian Big Muff without all the distortion and more sustain. I highly recommend this for any budding punk guitarist.